Five of the seven pharmaceutical companies who sent executives to testify on drug pricing before the Senate Finance Committee Tuesday have the top-25 highest-paid pharma CEOs for companies in the S&P 500. 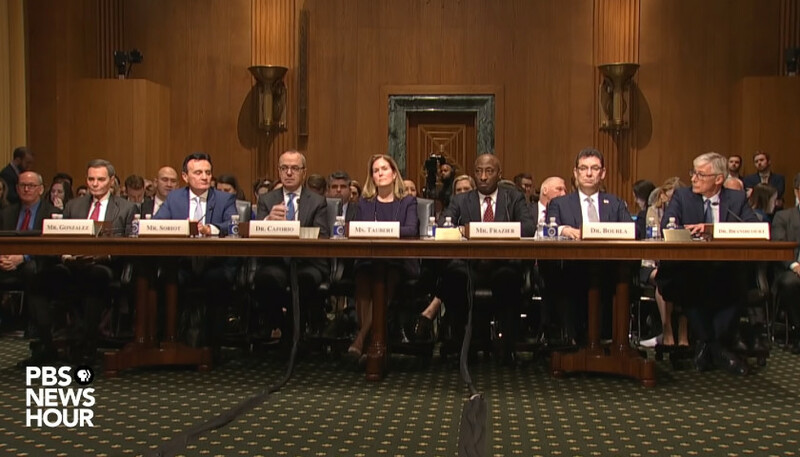 CEOs from AbbVie, AstraZeneca, Bristol-Myers Squibb, Merck, Pfizer and Sanofi plus Johnson & Johnson’s executive vice president of pharmaceuticals, Jennifer Taubert, were grilled by Senate Finance Chair Chuck Grassley and other lawmakers at the hearing. Altogether, the top-25 CEOs whose companies were represented Tuesday received a combined $116,671,792 in compensation, including stock and stock options, in 2017, according to analysis by The Wall Street Journal. That number includes annual compensation for former Pfizer CEO Ian Read, who ceded the position to new CEO Albert Bourla in January. Bourla testified before the committee Tuesday. Johnson & Johnson CEO Alex Gorsky rakes in the most out of the CEOs, with yearly compensation valued at $29,802,564, according to The WSJ. Taubert, who repped Johnson & Johnson and its pharmaceutical arm Janssen at Tuesday’s hearing, has no annual compensation data available according to Bloomberg. The runner-up is former Pfizer CEO Ian Read, who had yearly compensation of more than $27 million. He had agreed to delay implementing proposed prescription drug price increases after speaking with President Donald Trump in July. Trump told the company it should be “ashamed” of its price increases in a July 9 tweet. The CEOs of Abbvie and Bristol-Myers Squibb round out the top 10 highest-paid executives on The WSJ’s list. AbbVie CEO Richard Gonzalez made more than $22 million in 2017, and Bristol-Myers Squibb CEO Giovanni Caforio made more than $18 million in 2017. AbbVie has almost doubled the price of its arthritis drug Humira since 2014, bringing its yearly list price up to $60,000, according to CNBC. Gonzalez defended the company’s decision to charge a higher rate in the U.S. than overseas Tuesday. “If a market the size of the U.S. were to collapse to the lower end of that pricing model, I can just tell you that AbbVie would not be able to invest in the level of [research and development] that it invests in today,” he said according to NPR. Merck CEO Kenneth Frazier received $17.6 million in 2017, according to The WSJ. Sanofi and AstraZeneca’s CEOs make less than the chief executives at the other companies, but they’re still bringing home the bacon. Sanofi CEO Olivier Brandicourt received “a one-off golden handshake of 4 million euros ($4.5 million) in addition to making 4.2 million euros a year” in 2015, according to Reuters. That’s roughly $4.7 million a year. AstraZeneca CEO Pascal Soriot said it was “annoying” that he was on the lower-paid end of pharma CEOs after receiving roughly $12 million in 2017, reported FiercePharma in September 2018. Photo” Pharmaceutical Congress Hearing” by PBS News Hour.